Gaining visibility into what the user actually experiences, and isolating the root cause of performance issues. Problem: An online ecommerce site noticed that some users were experiencing unusually long load times, and the IT team was concerned this could impact purchases, resulting in lost revenue. Desired Outcome: Isolate the conditions under which a client experiences slow load times, then troubleshoot the problem and resolve it quickly. Solution: The team used the real-time visibility of the ExtraHop Discover appliance to determine that some users were experiencing long load times, then used the ExtraHop Explore appliance to isolate the conditions, find the cause, and remediate the slowdowns. User Impact: The IT department was able to respond to issues before users even reported them. In this case since the issue was occurring within the online shopping cart, fixing the problem led to an improved customer experience and preserved revenues. Latency and Error Monitoring for SMPP in solutions. The IT team for a large ecommerce company needed to monitor the performance of its online store in order to provide the best experience for customers. It can be difficult to maintain top site performance when you serve a diverse set of customers who access the site from a variety of devices, operating systems, and browsers. The online store application team had recently deployed a new build to add enhanced capabilities and improve usability for customers. The IT Ops team learned that an unusually high number of customers were now abandoning their shopping carts, which was negatively impacting sales. They needed to investigate this right away. The IT team suspected that there could be a load time issue, as customers are more likely to exit a site if page performance is slow. They needed to investigate current page load times and see under what conditions they were deviating from the typical experience. Some users were experiencing slow load times (nearly 8 seconds) for the online store, following a recent update that resulted in issues with certain client, operating system, and web browser combinations. To solve this problem the team needed a way to discover which users were being impacted, where the issue was occurring, and under what conditions. Using the ExtraHop platform, the IT team received alerts that some clients that were experiencing 8-second load times. They used the Real User Monitoring dashboard for the application to verify that there were indeed some spikes in page load time, but they were still unclear on which users were affected, what caused the issue, and how it was impacting the business. When they came to the client and browser sections of the dashboard they noticed that Windows clients with the Internet Explorer browser were experiencing extremely slow load times. The team then toggled from the dashboard view to the ExtraHop Explore Appliance, which offers rapid multi-dimensional search, data pivots, filtering, and analysis for any transaction. They ran a query to show page load times for individual transactions. From there, they were able to isolate the conditions that were creating the load time issue. After sorting the records to show the longest load times, they noted that the problem appeared to be occurring on one particular page, for users of Internet Explorer—and specifically, IE 7.0. They noticed that a recent code change corresponded to the beginning of the bad behavior. With ExtraHop, the team knew immediately that a problem was occurring, the magnitude of the issue, and which users were impacted. They had all the information they needed to triage the issue alongside their other daily activities, and more importantly, solve the problem quickly by targeting the root cause for the application team. 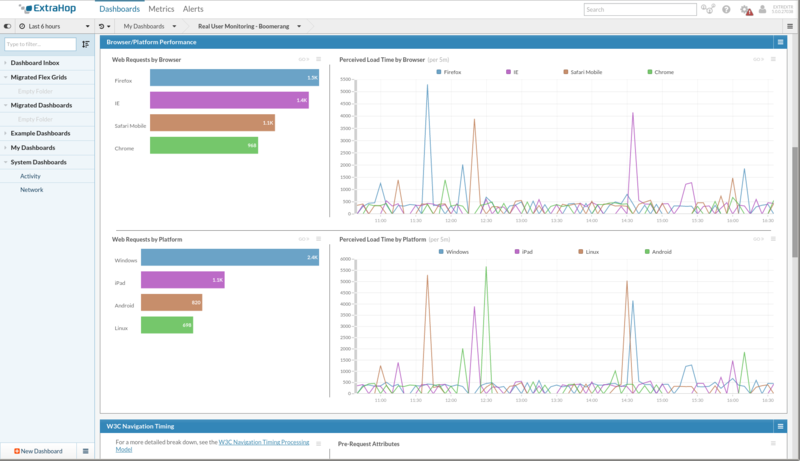 With the ability to see exactly what the user is experiencing, the IT Ops team went from simple break/fix to advanced monitoring and management of their applications and infrastructure. Most importantly, the IT team now uses this continuous visibility within their existing workflow, and empowers their IT staff to be more efficient and deliver improved service levels.